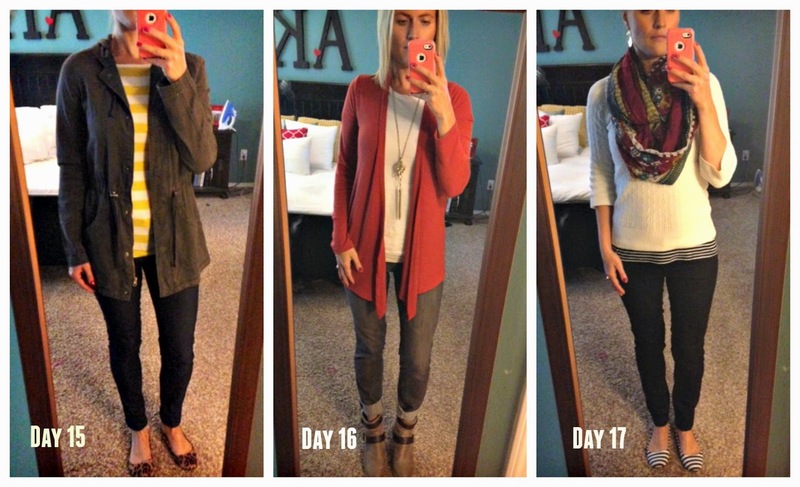 I can't believe we only have a handful of days left in the Fall Style Challenge. It's been a lot more fun than I had imagined and I feel like I've got some great new outfit ideas tucked away, that will help me not to stare at my closet, aimlessly, in the morning. Best part is the private Facebook group that posts daily pictures of the outfits. I'm loving seeing all of the variations of one look and being able to copy ones that I love! Seriously, if you are even thinking about doing the winter/holiday one, send me an email and we can chat. I think you'll totally love it! And Allison said that she'll be including a few more festive special occasion looks in there. Because I'll be out of town for a couple weeks, I'm not going to participate, but you can bet I'll be jumping right back in when I return from vacation! And if you are over the age of 40 and reading this blog, there is a brand new challenge (registration opens on 10/31) where she'll help you put together a special capsule of age appropriate wardrobe basics. Check out Allison's blog for more details: www.getyourprettyon.com. Day 12--This cardigan was a Nordstrom Anniversary Sale purchase and I'm in love with it. Just enough uniqueness to it that it doesn't look like every other cardigan in my closet. The scarf was a gift from my mother-in-law, and I believe she found it at Fuego. Finally, the grey wedges are from Target. They are my absolute favorite and I wish they still carried them because I'd buy a couple different colors! Day 13--This was probably the most challenging outfit of the challenge (ha!) for me because it felt very plain. And because I don't love wearing leggings with a sweater of this length. But I wanted to stick with it each day, so I tried it anyway! 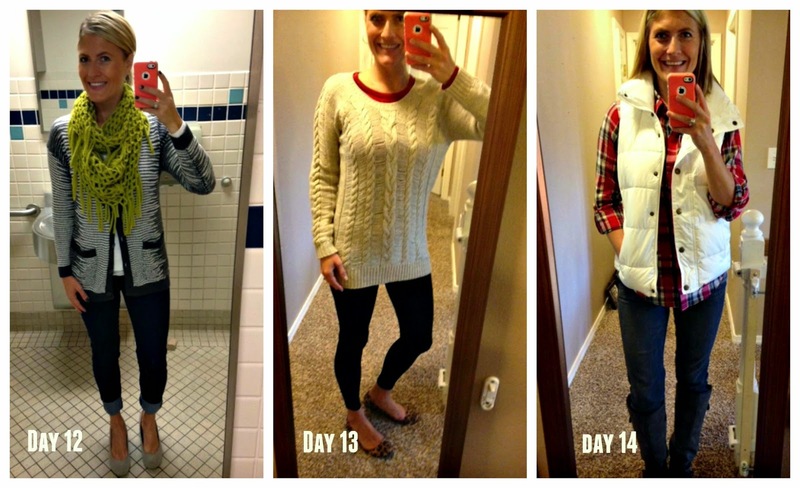 Sweater is from H & M, leggings from Nordstrom and leopard flats from Target. Day 14--One of my favorite looks from the challenge. Mostly because I'm loving plaid...remember? This wet seal plaid shirt, an Old Navy puffer vest paired with my grey jeans and Madden Girl boots. Totally fall. Day 15--Oh boy, this day was a complete wash. I cleaned up puke all day and literally never got out of my sweats. However, about 4pm, I decided to run upstairs, change into the recommended outfit and snap a quick pic. Sadly, it never got worn, but at least I'm storing the idea for later. Day 16-Recognize this cardigan? Yep. It's the one from my Stitch Fix box last week. I've actually never been complimented to much, on an outfit. So simple and very cute! Jeans are Wit & Wisdom's from Nordstrom. Booties are "Report" and necklace is Forever 21. Day 17--I had fun mixing patterns in this challenge! The sweater is Gap, undershirt is Old Navy, scarf is from Ross and the striped flats are from Ross. So cute!! Next week I'll have one final post about this style challenge and then it's over. I have really enjoyed participating and I hope you'll consider it, in the future, too. You know I'll be hounding you about it as one draws closer! If you want to see more pics, follow me on Instagram HERE or Facebook HERE. Very cute!! Would love to see more of the outfits from the challenge -- great ideas! Thank you! This means a lot to me!!! I really like your style, Kelly! Have enjoyed your pic posts in the fb group. Thanks for linking up! That scarf from day 17 is gorgeous! Looks warm and comfy!